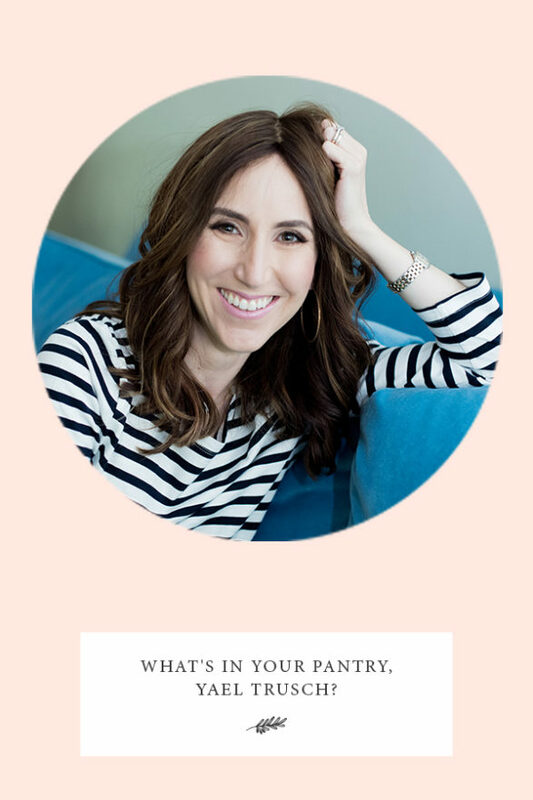 What’s In Your Pantry, Yael Trusch? What’s in Your Pantry? is a recurring feature where I ask women to tell us more about their food and eating habits by opening up their kitchen pantries to us. This week I’m featuring Yael Trusch. I met Yael online. I found her website and read her about page and realized we were both born in San Juan Puerto Rico in the same year. What are the chances? I wrote to her with my discovery and we have been corresponding every since. For those of you unfamiliar with Yael, she is the creator of the bilingual (Spanish and English) Jewish lifestyle Blog and weekly Podcast for women, Jewish Latin Princess. Vamonos! Let’s go into Yael’s pantry! I live in Houston, TX, the last place on Earth I thought I’d live. (But, then again, I never thought I’d live in China!) I was born and raised in San Juan, Puerto Rico but I’ve globe trotted plenty – from Boston, New York, Santiago, Buenos Aires, Miami, Jerusalem, Shanghai and now Houston. I love reading. Currently I’m reading Stars of David, because I recently interviewed the author for JLP Podcast (on her most recent book) and was curious about her previous work. I am married with four children, all of which provides great content for my blog, podcast interviews and courses I teach Jewish women. Plus, the big family makes me a much more patient and flexible person than I would otherwise be! 🙂 I’m an only child so it’s a bit of a change in lifestyle. My favorite food is dark chocolate – I eat it every day! (Why is it not in the food pyramid exactly!?) OK, wait, confession: I also love, love, love red meat as in a good steak … I probably should not say that on Jewish Food Hero! True though. Happy! First of all, I keep my pantry quite organized – OK I have to re-check from time to time, but for the most part everything is in bins and has assigned sections. I know where everything is! And there’s enough room for everything. We custom made the kitchen and I made sure that my pantry had enough space and these nice pull out shelves so I can store things with ease and overall make my time in the kitchen more effective. I love good food, but I try to be as quick and efficient in the kitchen as possible, so I can move on to other things. (Read: I don’t cook for fun!) So overall, this pantry makes me quite happy. I keep my grains in these amazing bins with labels from The Container Store, so I have a few shelves of those. Then I have a few shelves that are just kids’ snacks for their lunches. I have a few shelves for canned goods and things like that, and even within those, things are organized separately – teas are all together, the bottled things are all together, the canned things are all together. Bob’s Red Mill Flaxseed Meal and Bob’s Red Mill Whole Flax Seeds – I always have to have because I make the most amazing Flax Seed challah. I also have Better for Bread Flour and Whole Wheat Flour, both by Gold. Oh and Kirkland raw almonds because I snack on them all the time – Kirkland brand from Costco. Dark chocolate from Schmerling’s. Any dark chocolate will do, as long as it’s dark bitter chocolate. My husband brought some extra dark chocolate from Israel, as a gift for me, a couple of months back that as beyond good! I also love a good red wine, but my husband is not much of a wine drinker so I just make do with what is available locally and don’t get too picky. Recently though, we tried an excellent Pinot Noir by Baron Herzog on a trip to New York which we both loved, but I haven’t found it locally. Paired with a good steak it was really divine. Different in so many ways. First of all, I didn’t grow up in a kosher home and now I have a kosher kitchen so all the products in there are certified kosher. My mother always kept Coke and green olives in her pantry. My mother was a devoted Coke drinker. Ironically, I do not drink soda. Her preferred snack was Coke and green olives whereas my go-to snack is a piece of dark chocolate and a cup of English breakfast tea. I also remember seeing Ortega taco shells in her pantry and I still buy those! Your turn: What will you remember from Yael’s interview?